TORONTO, December 21, 2016, – The holidays may not necessarily be a merry time of year for all Canadian seniors according to a recent survey of attendees at the Toronto ZoomerShow, ZoomerMedia’s lifestyle expo for people aged 45 plus. The survey, sponsored by HomeEquity Bank, providers of the CHIP Reverse Mortgage™, found that many seniors overspend during the holiday season. In fact, 26% of respondents described the holidays as financially “very stressful”. A total of 632 Toronto ZoomerShow attendees were surveyed between October 29 – 30, 2016, the majority of whom (86%) were 55 years of age or older. The results indicate that respondents would prefer to spend less than they actually end up spending during the holiday season. Results also show a discrepancy between male and female spending. 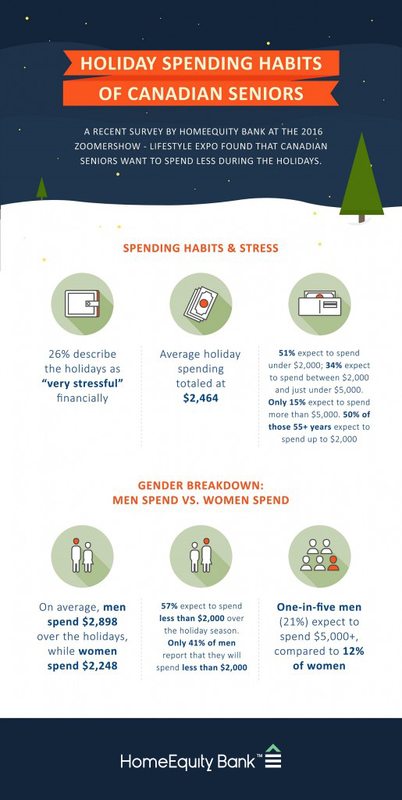 On average, men spend $2,898 over the holidays, while women spend $2,248. This difference in spending levels may illustrate that women work harder to keep on budget, which in turn may result in higher levels of stress. Survey respondents’ average holiday spending totaled $2,464, which suggests that expectations for spending over the winter holiday season are generally established and require some degree of financial planning. Just over half (51%) expect to spend under $2,000; one-third (34%) expect to spend between $2,000 and just under $5,000. Only 15% expect to spend more than $5,000. A majority of women (57%) expect to spend less than $2,000 over the holiday season. By comparison, only 41% of men report that they will spend less than $2,000. One-in-five men (21%) expect to spend $5,000 plus, compared to 12% of women. Half (50%) of those 55 plus years expect to spend up to $2,000. HomeEquity Bank, a fully-regulated, Schedule 1 Canadian bank, is the only national provider of the CHIP Reverse Mortgage™ solution. Founded 30 years ago, HomeEquity Bank has been helping Canadian homeowners aged 55 plus access the value of the equity they have in their homes, while still owning their homes until they make the decision to sell. HomeEquity Bank has partnered with CARP, Canada’s largest non-profit, non-partisan advocacy association for Canadians As We Age. CARP now recommends HomeEquity Bank’s CHIP Reverse Mortgage™ as a viable and comprehensive solution for Canadians planning for retirement. HomeEquity Bank is also ranked on the Canadian Business and PROFIT’s 28th annual PROFIT 500 list, the definitive ranking of Canada’s Fastest-Growing Companies.